Front, from left, Serena Finlayson of Yorkshire Building Society (YBS), Alice Judge, Edna Newton, Masey Hunter and Laura Armitage, also of YBS. Back, Betty Breare, Mick Hodlin, Margaret Baxter and Joan Allen show how they take part in their Strength and Balance Exercise Class. An aerobics class that enables pensioners to work out from their armchairs has received a much-needed funding boost to help keep its members active. Wigan and Leigh Pensioners Link received £2,000 from Yorkshire Building Society Charitable Foundation to continue running the class, after being nominated by one of the society’s customers for financial support. 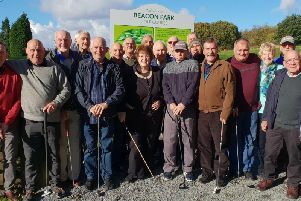 The charity works with, and for the benefit of, the over-50s in the Wigan borough to offer a range of social, keep-fit and educational classes. It aims to reduce isolation and give support, information and advice to those who access its services. Laura Armitage, manager of Yorkshire Building Society in Wigan, said: “Wigan and Leigh Pensioners Link is a fantastic charity working with older people in our local community who might otherwise be lonely. Mick Hodlin, chair of trustees for Wigan and Leigh Pensioners Link, said: “We can’t thank Yorkshire Building Society Charitable Foundation enough for their donation; we’re so grateful and really look forward to our Monday aerobics sessions. “We offer a range of services to help people who are over-50 but heavily rely on donations and volunteers to maintain what we do. To find out more about Wigan and Leigh Pensioners, book a place on one of their activities or enquire about volunteering, contact 01942 261753 or email contact@pensionerslink.org.uk. The foundation is funded through the Small Change Big Difference scheme, where members donate the pennies from the interest on their accounts just once a year to help smaller charities around the UK.